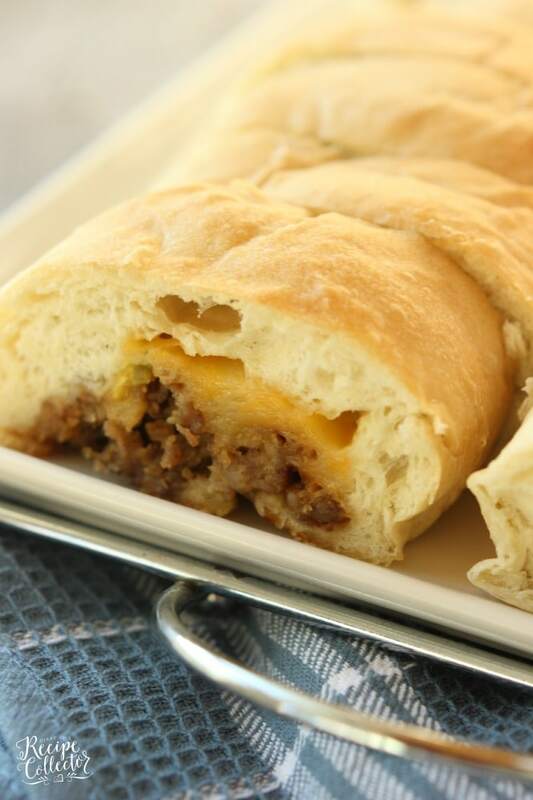 Stuffed Sausage Bread – This is an appetizer that is such a crowd-pleaser! 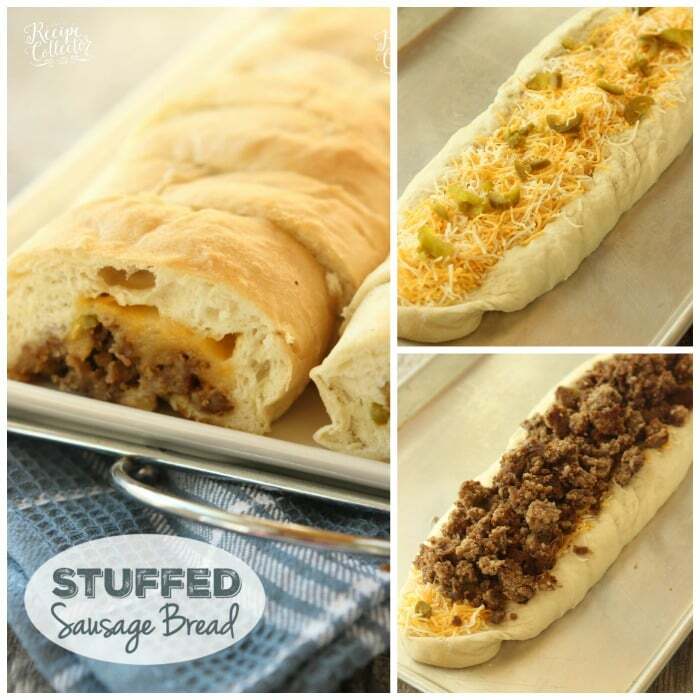 It starts with frozen bread dough and is filled with breakfast sausage, cheese, and jalapenos. Everyone LOVES it! *Update-This recipe was originally posted in 2013. It is by far my favorite thing to make for any gathering we go to for sure! So I had to share it again with all my new readers! See the VIDEO below for this recipe!! This is my favorite recipe for many reasons. I make it for most holiday festivities, birthday parties, etc. If I don’t make it for my husband’s family, they usually ask me why. It is a super simple recipe and such a CROWD PLEASER! My mom got this from a friend a long time ago, and I first learned how to make it when I was about 18. Around the holidays, I always have the ingredients (which are minimal) on hand. 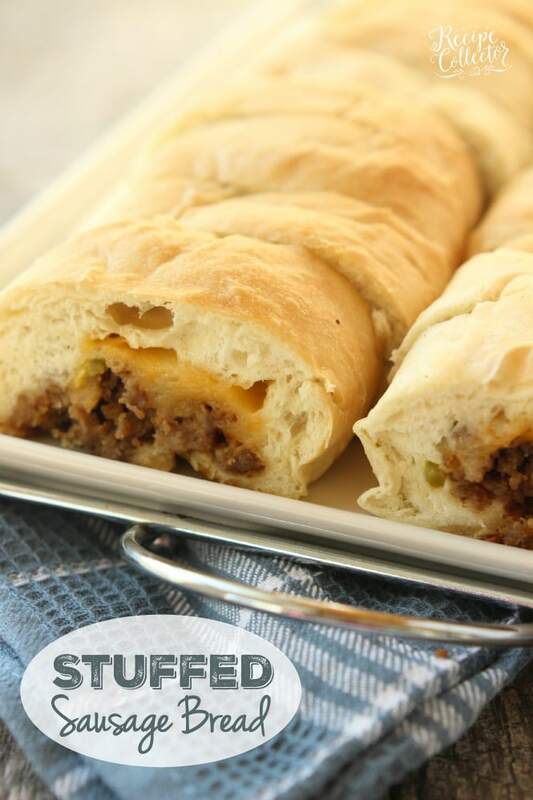 In fact, I refer to the holidays as “Stuffed Bread Season” when I am making my grocery list. The smell of this baking in the oven is total comfort to me. It reminds me of all the good and happy times and all the excitement centered around the holidays and fun times! Oh how I love this recipe! Now people normally ask me how to make it, and they seem quite curious as to how I stuff the meat and cheese in there. It seems complicated, but it is so easy! I’ve made so many of these. I can practically do it with my eyes closed now. Start out with a thawed bread loaf. I find these in the freezer section where all the rolls are. They usually come in packs of three…perfect because I normally make a lot. I thaw it out overnight by wrapping it in saran wrap and setting it in the fridge. I take it out about 30 minutes before I’m ready for it…usually while I’m browning the sausage. All you need to do is pull and spread the dough out a little. Don’t make it too thin along the bottom or it will tear. Then just top the dough with shredded cheese and jarred jalapenos and pull up on sides to seal it. Most of the time I DOUBLE the recipe because one loaf is never enough to feed a crowd! 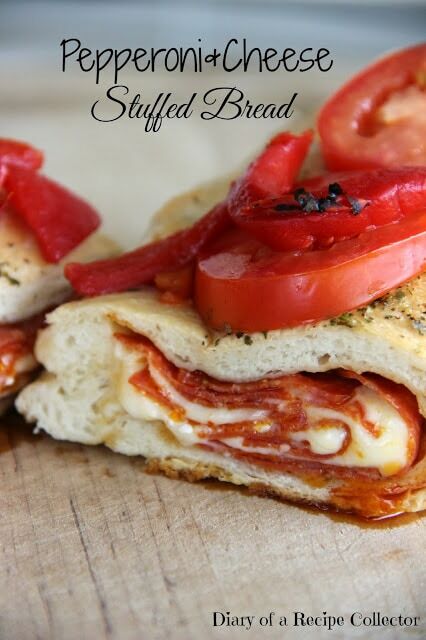 This is also great for breakfast or brunch too! Take THAWED dough out of fridge and let sit out on counter while you brown the sausage. Spread the dough out on baking pan. Sprinkle shredded cheese, then jalapenos, and then sausage. Pull sides of dough together and press to seal really well. Flip dough seam-side down and spray the pan under dough with a little cooking oil spray. Bake at 350 degrees for about 30 minutes or until golden brown. Let cool for 20 to 30 minutes and slice to serve. *I usually DOUBLE the recipe and make two. One disappears in no time! *Time management tip: I allow about 1½ hours for this recipe. 30 minutes to brown sausage and fill bread, 30 minutes to bake, and 30 minutes to cool. I can usually get it done a little quicker, but that is a good place to start the first time you make this. Many times, I will not slice it up until we arrive at our gathering. If that's what you choose to do, you can just start it an hour before leaving. *Usually I take frozen dough out the night before and let it defrost in the refrigerator (wrapped in plastic wrap). If I forget, I'll take it out and set it on the counter to defrost during the day and then refrigerate once thawed and until I'm ready to begin recipe. I've even followed the quick thaw method on the package directions, which involves using the oven. *Leaving dough out at room temperature thawed for too long will cause it to become very sticky and more difficult to work with, so I usually take it out of fridge once I begin recipe. will absoutly have to try this. Glad I found your site. 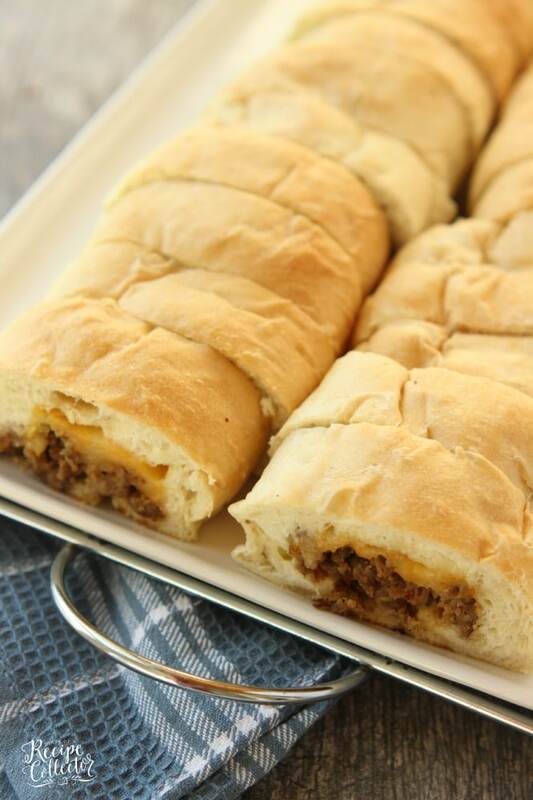 -A question about your Stuffed Sausage Bread recipe: after you have layered the fillings, I assume you pull the sides of the bread together and pinch them closed. And that THEN you flip the stuffed bread dough upside down to bake it. …And that’s why I don’t see a seam, and others have the notion that the bread is stuffed somehow after it is cooked.. I’m looking forward to trying this, but want to wait for your clarification. Hi Betsy! Yes, you do flip it seam-side down after sealing it. Thanks for asking! I updated the post last week and left that step out. It’s not a must, but it is something that makes it bake up a little neater. Then I lift it up a little and spray some cooking oil spray underneath it. Two brands I have found are Rhodes (at Walmart) and Bridgeford (at Kroger). Hope you love it!! If you have any questions while making it, send me a message through my blog facebook page, and I can respond faster. This recipe looks like something I had last weekend at a brunch, can you tell me what kind of cheese you use? It looks like cheddar. Hi Erica! I usually use colby jack cheese, but you can use cheddar too! 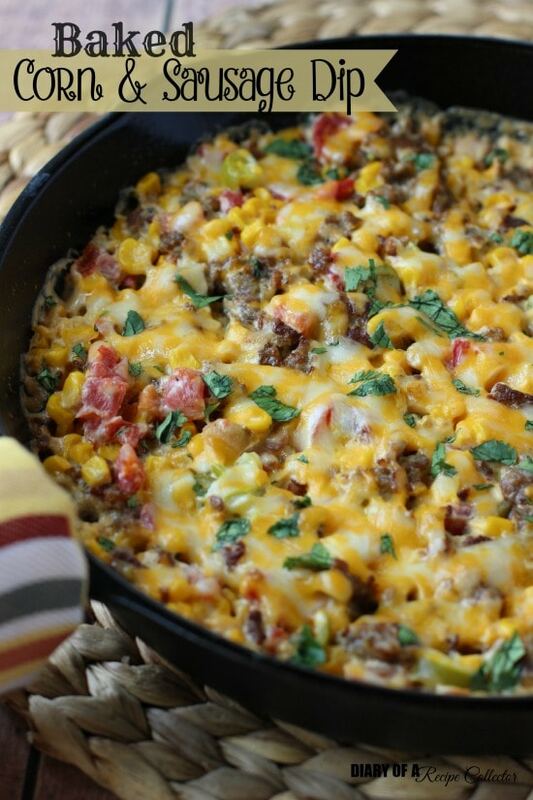 We LOVE this recipe!! Thanks for visiting! Could you freeze the loaves after you have stuffed and baked them? If so how would you re-heat them.. Would you slice them after re-heating,, Thanks! Hi Linda! My mom has frozen the loaves before baking. She then takes it out and lets it thaw and then follows the baking directions. This dough thaws pretty quickly. I have never frozen them after baking. I make this bread a lot and my family LOVES it!! This comment is exactly what I was looking for as I am interested in making several loaves and was wondering if anyone had ever basically “re-froze” after stuffing and prior to baking. So, just to make sure I’m clear, your mom has thawed the bread, stuffed it, and then froze it again stuffed to thaw and bake later? It still tastes yummy after the “re-freezing”? Hi Kelley! Sorry I missed your comment! I think this would be fine. I personally have not tried it, but my mom has and it turned out fine. What a creative idea! Seems pretty easy to do too!